As in normal usage, the word 'adjacent' in geometry refers to items that are next to each other in a figure. Usually applied to lines, arcs or angles. See below. In a polygon, adjacent angles are angles that are next to each other. They share a common side. For more on this see Adjacent angles. Adjacent sides are those the are next to each other. They share a common vertex. For more on this see Adjacent sides. Here, the side A is adjacent to the angle x. For more see Trigonometry functions overview. 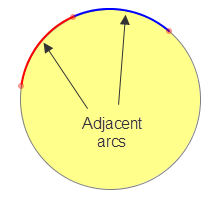 Adjacent arcs are those the are next to each other on the circumference of a circle. They can be combined to make a single larger arc. For more on this see Adjacent arcs.